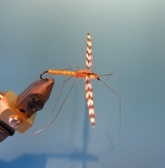 A fly fishing friend posted a request for a “Killer Crane Fly” pattern. I did a bit of research and sent him a link to a pattern I had seen on the web. 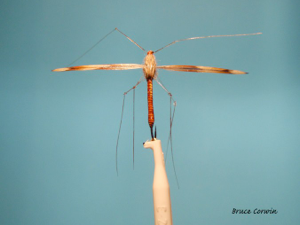 After thinking about it for a while, I decided to play around with a slightly more realistic crane fly. This pattern is a fishing fly with a few touches added to make it appeal to me, as well as the fish. It’s been said that there are no new patterns to be found in fly fishing... I’m sure someone out there might say this looks like the XYZ pattern, etc. If so, apologies in advance. I honestly haven’t seen a peccary body on a crane fly pattern as of yet. 1. Coat wings with FlexLock and preen toward tip. 3. Build the underbody with thread or fine dubbing. Make a bulge at the rear as per the natural's taper. 4. Tie in the peccary at the bend and wind toward the eye. 5. Tie off peccary, color it with marker. 6. Tie in wing case. 7. 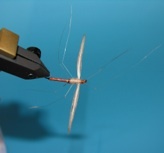 Set first 2 sets of legs and use superglue after tying in to set positions. 8. Set wings and dub to that point covering legs and wing tie in point. 9. Place last set of legs, super glue after tie in, pull turkey over and tie off. Check back... it should be up in the next week or so.